We just completed a really fun project, a Weebly to WordPress website conversion for THEN Center. 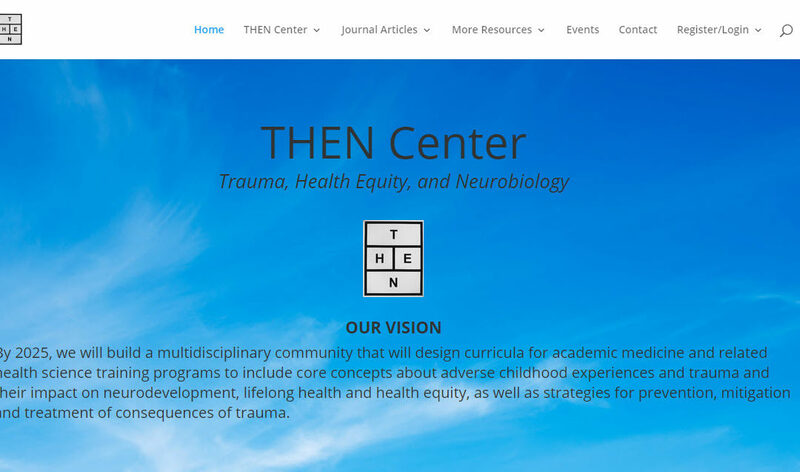 The Center is focused on research about the impact of traumatic experience, community violence, poverty, and long-standing discrimination on health. The site had been on the Weebly platform, which the Center ultimately found limiting. We previously had helped colleagues of THEN Center principals to develop a new WordPress site and were delighted to help out when they came to us for this new project. The site uses the Divi theme from Elegant Themes. We like Divi because of its flexibility and ease of use. The result is a mobile-friendly, responsive site that is easy to navigate and looks good on devices of all sizes. We had to import a fair number of web pages, and to convert that into appropriate WordPress content, as well as organize it logically. The results make the site easily navigable. The THEN Center depended on us to find and deploy relevant imagery. They also wanted, and received, a format in which it will be relatively easy to add new content for its membership. Indeed, to access content requires free membership. To obtain the valuable information on the site, users must first sign up. The goal for the trade off is to build a community of individuals interested in the topic. A free WordPress plugin, Ultimate Member, does the trick. Because THEN Center hosts with GoatCloud via our managed WordPress service, secure HTTPS browsing is part of the package.